If you have a dog, be ready that grooming will also become a part of your life. Grooming is an essential part of your dog’s life, as it helps to keep the dog in a good shape. Once you have a dog, be prepared that grooming will soon become a part of your life too. Many people think that grooming only involves brushing and hair trimming, but they are omitting many other tasks that are as important as brushing. Grooming also includes bathing, nail clipping, teeth brushing, facial cleaning, and so on. In general, grooming is a term to describe all the activities that keep your dog nice and clean. So, with many things involved, obviously, regular professional grooming sessions would cost you a fortune. So why should we waste money on something we can do on our own? Of course it is necessary to bring your dog to a professional once in a while for general check, but if it’s for weekly or daily grooming, it is not quite needed as you can totally do DIY grooming. Secondly, grooming is a great bonding time for both of you. You go to work all day, and your dog misses you so much. So why don’t you spend some time taking care of him or her while also giving yourself a good time with your little friend? There are many reasons why DIY grooming is favorable. So now comes the question: What do we need for grooming at home? Let’s take a look at these items for some recommendations! Tools may sound like a big word, but what it actually means is all the things you would need during bathing, and that’s all. Shampoo is very crucial during bath time because it helps to remove bad odor, dirt, and moisturizes your dog’s hair and skin. Thus, choosing a good shampoo matters to your dog. In order to choose a shampoo that is suitable for your dog, you need to understand the characteristics of your dog’s skin and hair. For example, if your dog’s skin is sensitive, use a gentle shampoo that soothes the skin and hair. 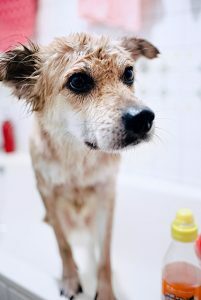 Gentle shampoos usually are made from natural ingredients, and do not include much cleaning agent so that they do not irritate your dog’s skin, while also keep his skin well moisturized. In another case, if your dog’s skin somehow is inflamed or affected by bacteria, medicated shampoo is highly recommended. These shampoos assist in skin treatment and help alleviate the symptoms. So overall, take some time to do your research before making any purchases. While dogs can air dry themselves, drying towels are necessary after baths. Imagine your dog is sopping wet after bathing and he still enjoys running around the house. If you don’t want to see your house in a great wet mess, wipe water off your dog after a bath with a dog drying towel. This is a really simple task, just like giving him a big warm hug as a nice compliment for being a good boy. Dogs need to be brushed regularly in order to remove tangles and prevent mats from forming. Especially for long-haired dogs, brushing becomes even more important. Mats are uncomfortable for dogs, and removing mats also helps to decrease shedding as well. So a brush is undeniably a needed tool for every dog owner. Depending on the size and the thickness of your dog’s coat, you can choose a brush accordingly. Let’s continue with the hair. Besides regular brushing, dogs also need hair trimming. For easy hair trimming at home, you can get a hair clipper. There are a great variety of hair clippers in the market from which you can choose. Hair clippers usually come in two varieties: cord and cordless. Cordless clippers require batteries to run, while cord ones do not. However, cordless are more convenient since you do not have to plug them in. So it really depends on your needs and your dog. One option is to get a hair clipper set that includes blades to replace the old ones. These sets are more economical and convenient when you have more than one dog. Now let’s move on to pedicure. The reason that you need to trim your dog’s nails often is that long nails do not benefit in any way. The nails can easily break off or cause injuries for you and your dog. Hence, clipping nails is suggested. All you need is a dog nail clipper. Clipping dog nails is not difficult at all, especially when you have a good pair of clippers. If it’s your first time, make sure that you ask a vet or a professional for a demonstration before doing it on your own uninstructed. You should only trim a bit of the tip, since underlying the other parts of dog nails are blood vessels that you do not want to damage. Last but not least in this article, we cannot omit oral and dental health. Dental health is crucial to your dog just like how it is to us. Some toothpastes are made with meaty flavors that dogs love, so using these pastes can make teeth brushing more enjoyable for dogs. In addition, toothbrushes are available in many sizes, and finger brushes are also common in marketplace. If your dog is small, you can try getting a small toothbrush. If your dog is bigger, finger brushes do work just fine on them. In short, regarding grooming tools, there are plenty of them for you to pick. The items above are the most essential ones that you can start with. Along the way, you can pick up more tools that are suitable for your need. To know how to choose the best tools, check out our other articles for tips. We hope that now you have a good start with dog grooming, and stay tuned for more tips coming up!